Outline: Contrasts earthly shallow friendships with the Friend who gave His life for His friends to rescue from the deceptive traditions of Satan. 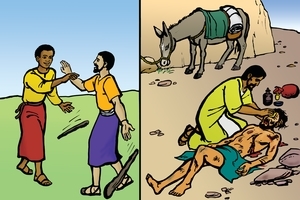 Illustration of a person with snakebite wanting a friend with medicine rather than one who only offers kind words. Be Jesus' friend and go to heaven. There are many people in the world who say they are our friends. What does this word mean? The people answer: A friend is one who treats me good and gives me everything I ask him for. A friend is one who brings me gifts when he comes to visit me. A friend is one who visits me every day. A friend is one in whom I have confidence and can tell any secret and know he is not going to repeat it or say bad things about me. Do you know what the Word of God says? "No greater love has any man than to give his life for his friends." There is only one friend who has done this for us because he was a real friend. This was Jesus. He knew that we were bad. He knew that God was going to punish us. He knew that the devil was making all kinds of lies so that we would believe that our traditions were the truth. He knew that if we followed the traditions and did not walk according to God's Word, we would go to hell when we die, thinking we would go to heaven. Jesus loved us so much that He took the punishment of God and died for us so that we could believe in Him and leave the devil and traditions and walk the way of the true God. If you were in the forest and a snake bit you and you knew you were going to die, which would you prefer, a friend who always gave you what you wanted and always visited you, or one who had the medicine for the snake bite of which you were dying? Which would you prefer, a friend who always treats you good and doesn't say bad things about you, or one who tells you how to escape from the devil and his traps to follow Jesus and walk the way of God? "As for me and my family, we choose Jesus and life eternal." The friendships of this world last only a short time but the friendship of Jesus is forever. Jn. 15:13, 14 - If you ask Him He will be your friend and help you every day. And when you die He will take you to His home in heaven. He is preparing it now for all His friends. There is great happiness there, and never any sorrow or death or sickness.